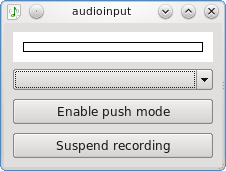 Audio Input demonstrates the basic use cases of QAudioInput. Qt provides the QAudioInput class to enable audio functionality within a standard application user interface. This example calculates the maximum linear value of the input audio from the microphone and displays the output.